For the Arab literature scholar and linguist, see Ahmad Reda. This is an Ottoman Turkish style name. احمد رضا بك is the given name, the title is Bey, and there is no family name. Ahmed Rıza in 1909 as an early opposition leader in the Ottoman Empire and the first president of the Ottoman Chamber of Deputies. He later became the president of the Senate as well. Ahmed Rıza Bey (Turkish: Ahmet Rıza Bey; 1859 – 26 February 1930) was a prominent Young Turk, activist, scientist, and statesman during the Second Constitutional Era of the Ottoman Empire. He became in 1908 the first President of the revived Chamber of Deputies, the lower house of the Ottoman parliament, and in 1912, he was appointed as the President of the Senate (the upper house) as well. He also served as Minister of Education from the Liberal Union party, the main opposition party to the ruling Committee of Union and Progress. In 1908, his name was among the candidates' list for the next Grand Vizier. He was the leading negotiator during the failed agreement of coalition between the Ottoman Empire, France, and Britain for World War I.
Ahmed Rıza has been described as a polymath by some authors. Ahmed Rıza was born in Constantinople (modern Istanbul) in 1859. He graduated from Galatasaray High School in Constantinople and subsequently studied agriculture in France. As a young man, he sought to improve the condition of the peasantry in the Empire. He was concerned with the conditions of the farmers and wanted to implement agricultural methods, supporting the ideas of the French sociologist, Auguste Comte. Like many of his other contemporary European progressives, Ahmed Rıza was opposed to colonialism, as well as class privilege. In 1894, he published a series of publications on unification of Islamic and Ottoman traditions of consultation. In 1895, Meşveret, the journal that he published, became a locus of the exiled Young Turks movement. 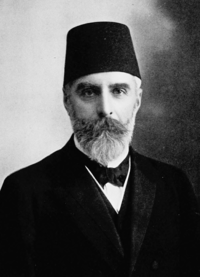 Ahmed Rıza opposed the maverick Prince Sabahaddin's calls for revolution and European intervention in the empire at the 1902 Congress of Ottoman Opposition in Paris. At the Second Congress of Ottoman Opposition in 1907, Ahmed Rıza at first reluctantly endorsed the use of violence to depose the sultan, but later reversed his position. As an educator, he enacted the inauguration of the second high school for girls in Turkey, the Kandili School for Girls in 1916 in Constantinople (it was intended to be the first, but World War I delayed the execution of the project). After retiring from public life at the end of World War I, Ahmed Rıza wrote his memoirs. They were published more than 50 years after his death in 1988 under the title Meclis-i Mebusan ve Ayan Reisi Ahmet Rıza Bey’in Anıları ("The Memoirs of Ahmed Rıza, the President of the Chamber of Deputies and the Senate"). He died on 26 February 1930 in Istanbul. ↑ Finkel, Caroline (2006). Osman's dream: the story of the Ottoman Empire, 1300-1923. Basic Books. p. 505. ISBN 0-465-02396-7. Retrieved 2010-06-07.